Fleur Philips doesn’t waste any space in her novel, Crumble. Her accessible writing style and well paced plot carry the story. It’s the kind of story which feels both familiar and new. 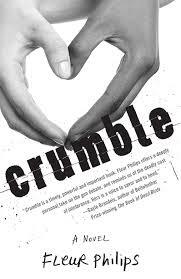 A San Francisco Book Festival Winner in YA Fiction, Crumble alternates between the perspective of Sarah and Alex, both high school students in Kalispell, Montana. Sarah is an average, small-town teenage girl who lives with her single-parent father, George – except for a secret she keeps from her traditionalist father. Sarah is dating one of the few black kids in town, and as is quickly revealed, becomes pregnant. Alex works for George, who owns a gun shop, and because of his tumultuous family life, develops a close bond to him. When George senses that something is off with Sarah, he asks Alex to keep an eye on her. As Alex discovers Sarah’s relationship with her boyfriend, David, both of their lives begin to unravel. Sarah, caught between love, practicality, and loyalty to her father, searches for a solution that will keep everyone happy. As the novel comes to a close, Alex, armed with both George’s fear for his daughter and new familiarity with guns, considers taking it upon himself to right any wrongs in honor of the man who has helped him. Though the first chapter starts slow in order to introduce many characters, the pace picks up quickly as Sarah’s situation complicates. There is a clear sense of tension about her relationship with David from the beginning, as Sarah knows the social expectations set by her community: “Reggie, Jalen and David aren’t treated any differently than anybody else, as long as the mingling of blacks and whites stays within the boundaries of friendship. But for me to be dating one of them?” (20). Philips makes sure to give the characters complexity beyond differences in race, (with only the exception of David’s parents, who seem to take the news of the relationship and the pregnancy very easily), and provides an interesting backstory that weighs heavily on each of the main characters. By switching points of view, she provides a full landscape of the world these characters inhabit. The dialogue and interaction of the younger characters is realistic and well structured. One of the most compelling aspects of this novel for me is the dynamic between Sarah and George, and how this secret changes their home life in a profound way. With Crumble, Philips has highlighted the tensions that still exist today about interracial relationships, and contributed to the dialogue about the modern face of racism. She does this with characters than can fully connect with a young adult audience and with a twist at the end, offers a glimpse of a reality that is far from perfect. The switch in POV is surprising and refeshing. What made you chose to write in two POVs? I had originally written the story in 3rd person for both characters, alternating chapters. By doing this, I allowed myself to remain a safe distance from both of them, but after rereading the novel (and having several other people read it), I felt I needed to be more in touch with Sarah’s character. For some reason, she felt too distant from me. Once I rewrote the story with Sarah in first person, I was able to ask more in regards to her feelings and emotions, and I think this made the novel more powerful. How did Alex’s POV open up the story for you? One the contrary, I needed to remain distant from Alex, but I also needed Alex to have a voice, more than just from Sarah’s perspective, which is what he would of been if I’d written only from Sarah’s POV. Although I personally wanted to be distant from Alex (as the author), I didn’t want my readers to be. I wanted them to identify with Alex, not just Sarah. By allowing Alex to have his own voice, I was able to create an identity for him that would have not happened otherwise. In light of several school tragedies, did any current events affect the way you approach the end of this novel? No. I actually finished the novel a few weeks before the Sandy Hook tragedy, and I find this ironic because Alex doesn’t obtain his gun by purchasing it (as did James Holmes in the Colorado movie theatre shooting). Alex was given the weapon, and taught how to use it, by the man he considered his mentor (much like Adam Lanza who took the weapons he was taught to use by his mother and that belonged to her). I has actually considered going back and changing the ending after Sandy Hook, but I realized I’d be going against my writer’s instincts – the “go with your gut” ideology. As a reader, I always want a happy ending, but in the real world, this just isn’t the case. If I’d changed the ending in light of current events, I would’ve done it for the wrong reason. You write about how antiquated race politics can still persist in modern times – what about this theme resonates with you? I guess I just don’t understand how race is even an issue anymore, and that misunderstanding infuriates me. Writing about it helps relieve some of the anger. Can you share any of your own race-based experiences and/or the differences or similarities you’ve witnessed between Montana and California? I have friends who are the children of mixed couples, and I have friends who are in biracial relationships. So, although my personal experience is secondary, I have witnessed the looks and heard the comments, and as I mentioned above, it just infuriates me. In Montana, I grew up on a reservation, so my high school was roughly 70% white and 30% Native American. There was definitely a divide between us, but I don’t feel that division was as obvious as it might be in parts of the rural south between whites and African Americans. I’ve lived in Southern California now for almost 12 years. When I go back to Montana, I definitely see the difference, although at times subtle. For example, the anti-Obama stickers in places up there aren’t as politically correct as the ones you might see down here. In Crumble the intolerance is not necessarily obvious. Nobody is throwing stones in windows or egging cars, but there’s a definite tension. And that’s what it’s like in Montana – quiet, but apparent. Though Alex wants to be the hero, no one in the story comes out as a savior for anyone else. Was this intentional? How do you approach writing complex characters? I’m not sure I intended this, but I realized after finishing the novel that nobody could have been a savior. The pure lack of communication between and characters and anybody with authority would have made that impossible and therefore, unrealistic. The novel is well thought out and plot driven. How much do you outline before diving into writing? I’m a firm believer in developing an outline before diving into writing. I do this both with the story and the characters (which helps in creating complex characters). Just like the story, the character needs to be mapped out and then fleshed out. How did you approach writing characters that are different from you, such as David and his family members? Find Fleur’s novel on Amazon and at Barnes and Noble online. You can also follow her on Twitter.